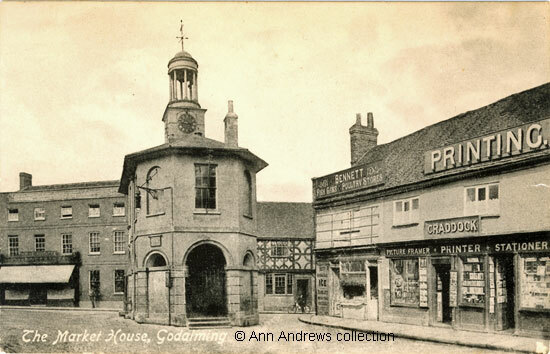 Here are views of the eastern side of Godalming's Market Hall that were taken at the beginning of the twentieth century. Immediately behind the Pepperpot, as the Market House is known today, is the junction of the High Street and Church Street. Some of the old timber framed properties on Church Street can be seen to the right of the building. On the left is the shop of Robert Agnew Robertson and the long sign at roof level tells us he was a milliner, dressmaker and ladies' outfitter. Mr. Robertson was the son of an Edinburgh silk mercer; he moved to the City of London before opening his Godalming drapery some time before 1901. He was still trading in the town in 1924. Nearest to the camera, on the right in the top image, we can see Godalming Post Office at 42 High Street. The previous location had been at what was then 108 High Street, close to the Bridge Road / Wharf Street junction. 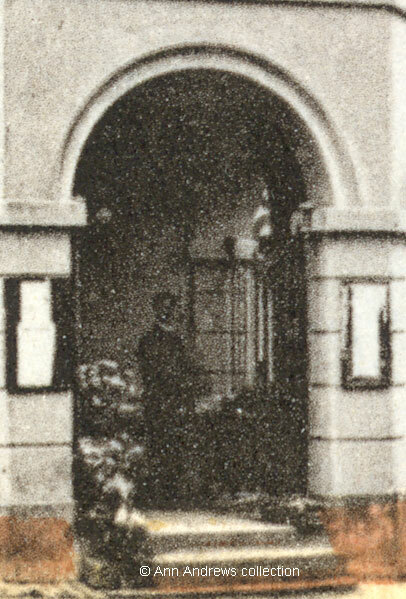 Robert Dixon, who had moved to Godalming in July 1887, was still the postmaster in 1903 when this was taken so must have supervised the relocation to this end of the High Street as he didn't retire until 1904. By 1901 the Post Office authorities were intending to erect a new post office at Godalming. "The present building, although very large, has proved altogether inadequate for the business, which has grown immensely during the past few years". By 1911 these PO premises had become the London City and Midland Bank and the Post Office had moved to the building opposite the Red Lion where it remained for many years before moving to the back of Waterstones bookshop. It has just relocated (Sept 2017) and is now back in its original building (now No.5 High Street). The second image provides a better view of the two shops, Bennett's and Craddock's, that were closest to Church Street. By 1924 Henry Edward Craddock ran a printers on Church Street and a stationers at 43 High Street but the Craddock who was running the family business when these two pictures were taken was his father Henry Thomas, the publisher of the "Godalming Almanack & Directory". The business had been established in 1853 by Theophilus Chennell and in 1878 Mr. Craddock described his printing business as "near the Post Office". Presumably he meant he was near the former post office as he was at this location in 1891 and still here in 1913. Theophilus Chennell's business was further down the High Street. Mr. Craddock was in Godalming from some time before 1877 and moved from Mr. Chennell's former premises to the location beside the Pepperpot shortly after took over the printing business. He took an active part in town affairs was both an overseer in the town and acted as a borough auditor. John Bennett was a fishmonger at 44 High Street by 1913; the shop unit seems to be vacant in the top image but the advertisement for ice to the left of his shop doorway appears in a 1907 image so he was almost certainly already here by then. He also sold game and poultry, employing several men as his assistants, and provided a delivery service for his customers. At one of the tribunal hearings that were run during the first war to recruit eligible males to serve as soldiers we learn that by 1916 four of his assistants had enlisted and he had three left. He had applied for the exemption of 31 year old George H. Wallis of 2 Mint-street but the application was refused. The following year he applied again, this time on behalf of George Edward Simmonds (31), an assistant roundsman who only had one eye. Simmonds had initially been rejected, then was placed in category A but because of his eyesight was then placed into category W. However, he had been re-assessed and had been put back into category A which is why he was being reconsidered. Mr. Bennett said if Simmonds went the rounds would have to be closed down but further exemption was refused. Despite these setbacks Bennett's fishmongers was a presence on the High Street until at least 1924.
underneath the Market House building. He is surrounded by buckets full of flowers. is a greyish white, but the second picture shows it was unpainted. 1 and 3. 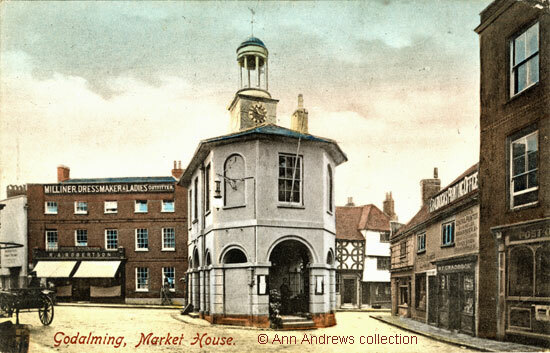 "Godalming, Market House". F. Frith & Co. Ltd., Reigate, No.49265. First published 1903. Printed in Saxony. Not posted. 2. "The Market House, Godalming". No publisher. Printed in Great Britain. Not posted. Postcards in the collection of, provided by and © Ann Andrews. In 1881 Robert Agnew Robertson, the third son of Robert and Florence Robertson, was living with his parents and several siblings at 5, Northumberland Street, Edinburgh. By 1891 he had moved down to London and was then at Warwick Lane, St Faith under St Paul, City of London. It is not known who his employer was at that stage, but he "lived in". "Kelly's Directory of Surrey", 1924. Mr. Robertson passed away at the Kensington Gardens Hotel on 4 Nov 1935 which was described as a nursing home in The Scotsman of 5 November 1935. The 1897 Ordnance Survey Country Series map of Surrey shows the PO close to the Bridge Road / Wharf Street junction with the High Street. "Surrey Advertiser", 27 February 1915. Obituary of Mr. R. Dixon, who had been Godalming's postmaster for 17 years until his retirement. "Surrey Mirror", 20 September 1901. The Post Office was already at the west end of the High Street as it was shown there in the 1901 census which was taken a few months before the newspaper story was published. The 1911 census, available on Find My Past. The 1916 OS map shows Godalming Post Office at the High Street / Mill Lane junction. "Kelly's Directory of Surrey", 1924. "Post Office Directory", 1878. The entry is possibly misleading as it perhaps implies that Mr. Craddock set up the business, but that would not have been possible as he neither lived in Godalming at the time nor was he old enough to have done so. Theophilus Chennell had previously published the Godalming Almanack & Directory ("West Surrey Times", 29 January 1870). "Surrey Advertiser", 2 May 1917. Death of Mr. H. T. Craddock. He passed away at his home on Chalk Road in 1917. "Kelly's Directory of Surrey", 1913. Theophilus Chennell died in Guildford in 1879; he was born in 1830. He was survived by his wife Ann. The family were living in Godalming in the 1871 census and he advertised as a printer, bookseller & stationer in both "Kelly's 1855 Directory" and the "Post Office Directory", 1867. "Sussex Advertiser", 26 June 1877. Mention in an unrelated article of Mr. Craddock's printing establishment at the "narrow part of the High Street" (i.e. next to Pepperpot). He was probably in Godalming about 1873-4 as one of his daughters was aged 7 and shown as born in the town in the 1881 census. "Surrey Advertiser", 24 May 1916. Godalming Tribunal. "Surrey Advertiser", 11 June 1917.